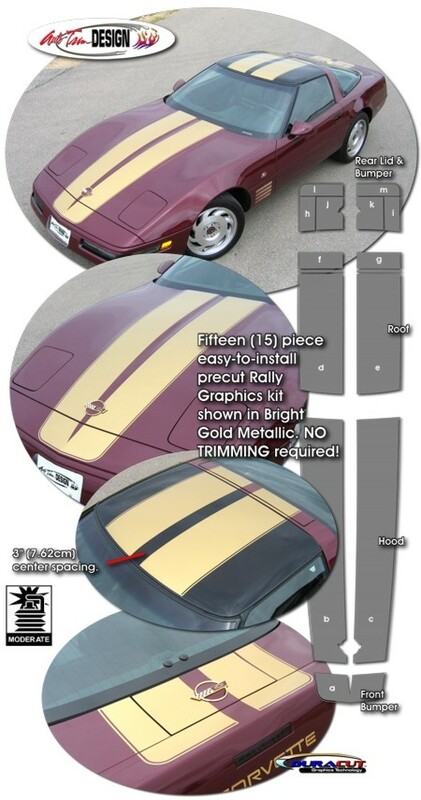 Make your '84-'96 Chevrolet Corvette C4 Coupe or Convertible stand out with this Bumper, Hood, Roof and Rear Deck Lid Rally Stripe Graphics kit. Coupe (shown) kit comes with fifteen (15) pieces while the convertible is provided with eleven (11) pieces. They're PRECUT and ready to install in a wide variety of colors - there is NO TRIMMING required! This stripe package is not just a set of 10" strips in a box. Our graphic kit consists of prefitted and contoured pieces as shown in the illustration and specifically fits any '84-'96 Corvette C4 with factory hood, roof and rear deck lid areas. It will not fit any other vehicle. Stripe width is approximately 11" (27.94cm) and set for a center spacing of 3" (7.62cm) while a .20" (.51 cm) pinstripe borders the outside edge as shown. 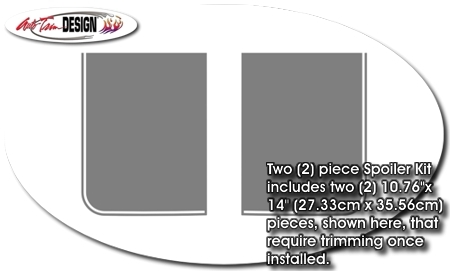 Optional Spoiler Kit (ATD-CHVCRVTGRPH33) consists of two (2) precut 10.76"x 14" (27.33cm x 35.56cm) pieces that require slight trimming (to length) once installed.